Another great way to start of 2018 is with a returning client celebrating a birthday! Michael was one of my newborn babies last year and I remember him with long skinny legs and wearing my knit bear hat. Just check out this cutie and his adorable little lips! I had fun taking a trip down memory lane and revisiting his newborn session just to see how much he's grown and changed in one year. It's always amazing to see how much babies become little people with big personalities in such a short amount of time. Michael isnow an active little boy who army crawls around, has a great belly laugh, and obviously loves his parents. His whole face just lit up when mom or dad would make silly noises. He had fun with my little straw hat, throwing it on the floor several times, then trying to put it on his head himself. I also pulled out my tan crate that we'd put Michael in as an infant, although this time instead of hanging out on the side, his whole body was scrunched up in there! I love to take photos like that just to show how big these babies have grown. 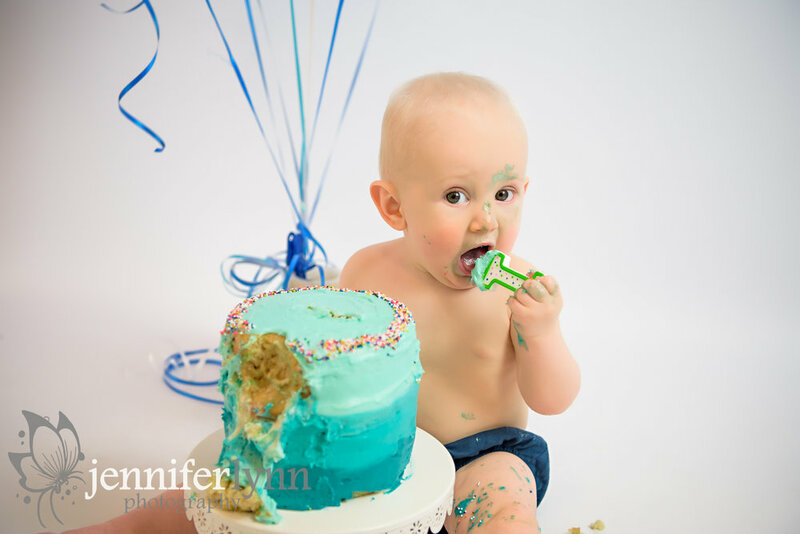 We finished up the session with a fantastic cake smash! His mom hand made a beautiful (and I assume delicious!) cake just for her little guy. Michael was unsure at first, but once he found the sprinkles, frosting, and marshmallow cream inside, he was a fan. My favorite part was when he started to get a bit sleepy and rubbed his eyes, of course spreading blue icing all around his face. A very happy first birthday to Michael! I am so glad I got the chance to see you and your family again and document a truly big milestone. Have a wonderful birthday party with all your family and eat another piece of cake for me.